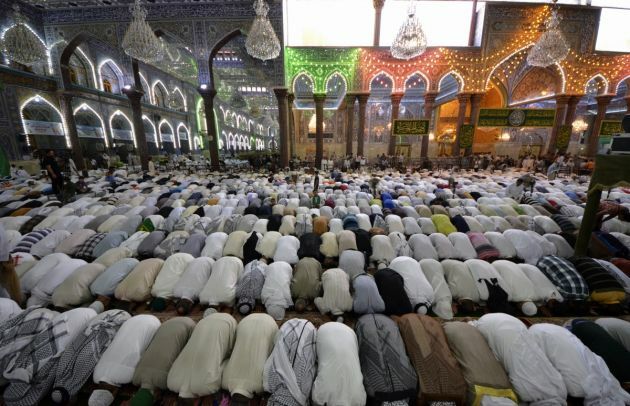 (Photo: REUTERS / Mushtaq Muhammed)Shi'ite Muslims attend Friday prayers at the Imam Hussein shrine in the holy city of Kerbala, June 13, 2014. Iraq's most senior Shi'ite Muslim cleric urged followers to take up arms against a full-blown Sunni militant insurgency to topple Shi'ite Prime Minister Nuri al-Maliki, escalating a conflict that threatens civil war and a possible break-up of the country. In a rare intervention at Friday prayers in the holy city of Kerbala, a message from Grand Ayatollah Ali al-Sistani, who is the highest religious authority for Shi'ites in Iraq, said people should unite to fight back against a lightning advance by militants from the radical Islamic State of Iraq and the Levant. GENEVA – U.N. High Commissioner for Human Rights Navi Pillay has urged all of Iraq's political and religious leaders to unite in opposing "efforts to rip the country apart along sectarian or geographic lines." On Sunday at his weekly Angelus address from his Vatican balcony at St. Peter's Pope Francis said, "I invite all of you to unite yourselves with my prayer for the dear Iraqi nation." He called for prayers, "especially for the victims and for those who most suffer the consequences of the growing violence, in particular the many persons, among whom are so many Christians, who have had to leave their homes." The Anglican Communion had also issued calls for prayers and help in Iraq in a statement on Friday following the rapid deterioration of security in recent days in northern Iraq due to the invastion of Islamist extremist forces. Their aim is to create their own area straddling Syria and Iraq known as an Islamist Caliphate a move that has created global alarm. Pillay on Monday condemned the reported cold-blooded executions of hundreds of Iraqi soldiers who were unable to fight, as well as civilians, including religious leaders and people associated with the government, by forces allied with the Islamic State of Iraq and the Levant, known as ISIL or ISIS. "Based on corroborated reports from a number of sources, it appears that hundreds of non-combatant men were summarily executed over the past five days, including surrendered or captured soldiers, military conscripts, police and others associated with the Government," Pillay said. "Although the numbers cannot be verified yet, this apparently systematic series of cold-blooded executions, mostly conducted in various locations in the Tikrit area, almost certainly amounts to war crimes." According to information received by the UN human rights staff on the ground, in the past few days, forces affiliated with ISIL also executed the Imam of the Grand Mosque in Mosul on June 12 for refusing to pledge allegiance to ISIL. It had also received reports of additional executions of religious leaders, including on Saturday, 14 June, when 12 local Imams were allegedly executed in front of Al Israa mosque, also in Mosul, for the same reason. The Anglican Communion News Service reported Friday that the Diocese of Cyprus and the Gulf and the Anglican vicar of St George's Church in Baghdad had issued a call for prayer and help. It said an estimated half a million people, including hundreds of Christian families, are fleeing the area with many attempting to find refuge in the nearby Kurdish provinces of Northern Iraq. At least one Assyrian church in Mosul had been burned down in the recent violence. A statement from the diocese said that Christians were feeling particularly vulnerable, "especially in light of the treatment of Christians in the Raqqah province of northern Syria where ISIS has also established its authority. "Recall that, in February 2014, ISIS commanders in Raqqah forced Christian community leaders to sign a contract agreeing to a set of stringent conditions. "These included the payment of a special tax (known as jizya), conduct of Christian rites only behind closed doors so as to be neither visible nor audible to Muslims, and adherence to Islamic commercial, dress code and dietary regulations. "Mosul and the surrounding Nineveh plain is the traditional heartland of Iraq's Christian communities, said the statement. Many Christians had fled to the region around Mosul when forced to leave Baghdad and other areas in recent years. "Christians are alarmed at the ISIS take-over of Mosul, fearful that this will further accelerate the decline of the Christian presence in Iraq." "Mosul and the surrounding Nineveh plain is the traditional heartland of Iraq's Christian communities. "Many Christians fled to this region when forced to leave Baghdad and other areas in recent years. Christians are alarmed at the ISIS take-over of Mosul, fearful that this will further accelerate the decline of the Christian presence in Iraq," said the Anglican statement. In her statement Monday Pillay said, "The provocative language used by ISIL, which has been talking about 'liquidating herds of sheep' and inciting sectarian tensions is clearly intended to sow further chaos and bloodshed in the country. "The people of Iraq have shown remarkable resilience in the face of constant suffering over the past decade. This new wave of fighting and extreme violence is very dangerous, not just to Iraq but to the entire region. "I urge all the country's political and religious leaders to unite in their opposition to these efforts to rip the country apart along sectarian or geographic lines," said Pillay.